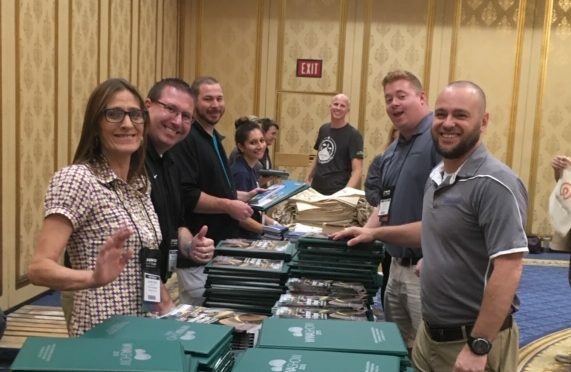 Being a WWA volunteer at the annual show is a great way to meet new people and grow your industry knowledge and connections whether you are a newbie or you’ve been around a few years. We usually need 30-40 volunteers and spaces start to fill up in mid-summer. Have a few questions about volunteering? Take a moment and review the following answers to some common questions. We hope this information will further encourage you to join our Volunteer team. What expenses does the WWA cover for Volunteers? Our Volunteers receive complimentary registration for the Symposium Package, which includes all social events, the trade show, keynote sessions and the breakout educational sessions. We also provide lunch for Volunteers on most days they help out. Registration fees are not waived for Optional Special Events and Workshops such as AFO, CPO, WWA University workshops or others listed as separate fee items on the registration form. But as a Volunteer, you’ll get the Symposium Package free and will only need to register for the Workshop you want to add-on. Will I be able to attend educational sessions if I volunteer? We do our best to assist our Volunteers in attending (usually by acting as room monitors) the sessions in which they are interested. We have to work around our staffing needs and the demand for specific sessions, but we’ve been able to make sure our Volunteers met or exceeded their session goals. As a WWA Volunteer, what will I be doing? Our Volunteers have been an indispensable part of our Convention Team. Where we need the most assistance is with registration, networking events and session-room monitoring. We also have lots of other types of jobs, including taking tickets, handing out ballots at the General Session, directing seating at the General Session, providing direction within the convention center, running errands for speakers and staff, making and collating photocopies and helping set up before the convention begins and packing up after the event concludes. As you might expect, we generally rely on our Volunteers to help out with whatever needs arise. Sometimes these tasks are not the most glamorous of jobs, but we offer lots of opportunities to network and have a great time! When will I be needed? Our pre-conference workshops begin on Monday, October 7th and set-up begins Sunday, Oct. 6th. We need Volunteers everyday from Sunday through Thursday; the schedule varies depending on the day. We request commitments from Volunteers as to their availability of dates, times and number of hours. Simply inform us of when you want to work and when you can’t and, if your availability meets our needs, we will work out the details. We have the most need for assistance on Monday, Tuesday and Wednesday.